Welcome to Magoemon. This is one of the larger Gassho Zukuri style of accommodations in Shirakawa-go with six guest rooms accommodating up to 18 guests. There is a Japanese-style open hearth, and from Magoemon guests can even see an old fashioned wooden suspension bridge over the famous Shirokawa river. Magoemon serves fresh, seasonal vegetables throughout the year. Check-in is after 15:00 and check-out is before 10:00 am. 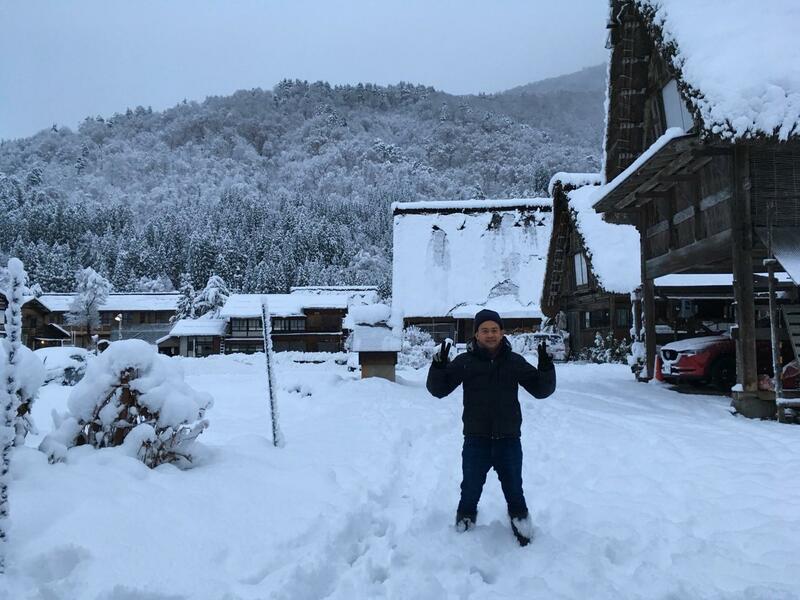 Snow Warning: There is a lot of snow in Shirakawa-go in January and February so please bring a pair of snow boots. Shirakawa-go can get up to 2 meters (over 6 feet) of snow in February. 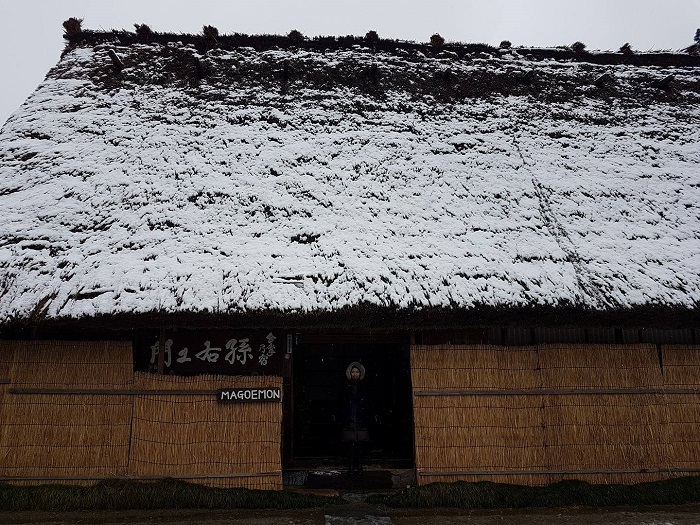 We were a group of 6 travelers who had the wonderful opportunity of lodging at Magoemon, in the picturesque Ogimachi village of Shirakawago. Upon arrival, we were given a warm welcome by our host, a sweet and kindly old lady, who took us on a quick tour of the house and pointed out a notice in English at the reception counter, indicating meal times (dinner at 6pm, breakfast at 7.30am) and bath times (6-7.30am, 4-5.30pm, after dinner-9pm). With some hand gesturing by our friendly host, coupled with an audible English word or two within a string of Japanese words, I think we managed to grasp the key message conveyed to us. We cherished the experience of staying in a Gassho-style thatched house - practically-architected and aesthetically-pleasing! Furnishing and deco was simple and minimal, hence allowing the architecture of the building – with its solid timber beams and wooden walls and delicate sliding doors – to be the focal point (note: walls are thin and you will be able to hear your neighbors, despite them speaking in low decibels). Bedrooms were cozy with sufficient heating. 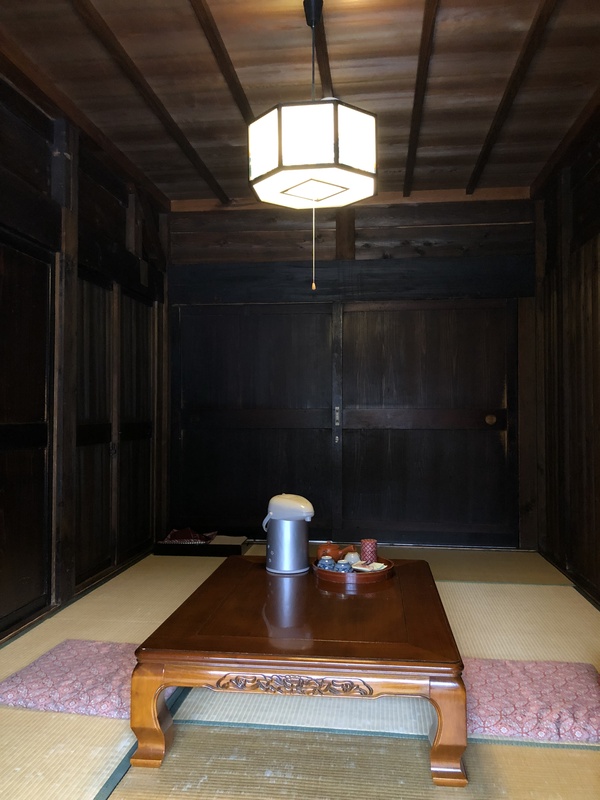 In the day, the furnishing consisted of a low Japanese table with some cushions on a tatami mat. By night time, the table had been replaced by comfortable futons that were discreetly brought in and set up in the room, while we had dinner. The 6 of us were housed in 3 rooms on the ground floor, separated by sliding panels i.e. we had the option of opening the panels to form a rather large space. Sliding panels also opened up to a picturesque view overlooking a street with neighboring Gassho houses, framed by misty snow-capped hills. As for the bathrooms, there were separate toilets for ladies and gents and 1 common bathroom with 2 showers and a wooden Japanese hot tub within a shared space (two in the family would be able to shower at the same time). The lovely traditional-looking bathroom with modern amenities and hot water was spotlessly clean. 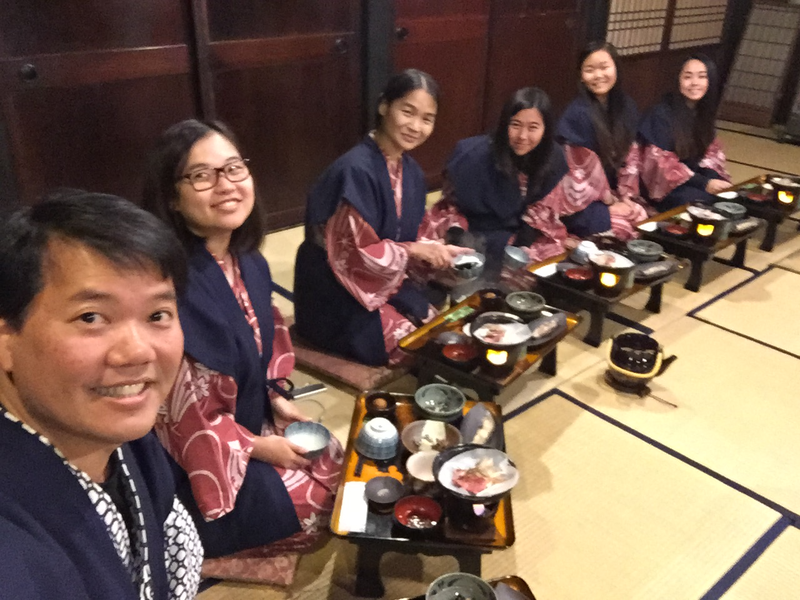 Meal times were something we looked forward to, where we attempted to dress-Japanese by donning yukatas provided by the ryokan and sit-Japanese on tatami mats at our little individual tables neatly positioned around a traditional Irori hearth in the atmospheric dining area. 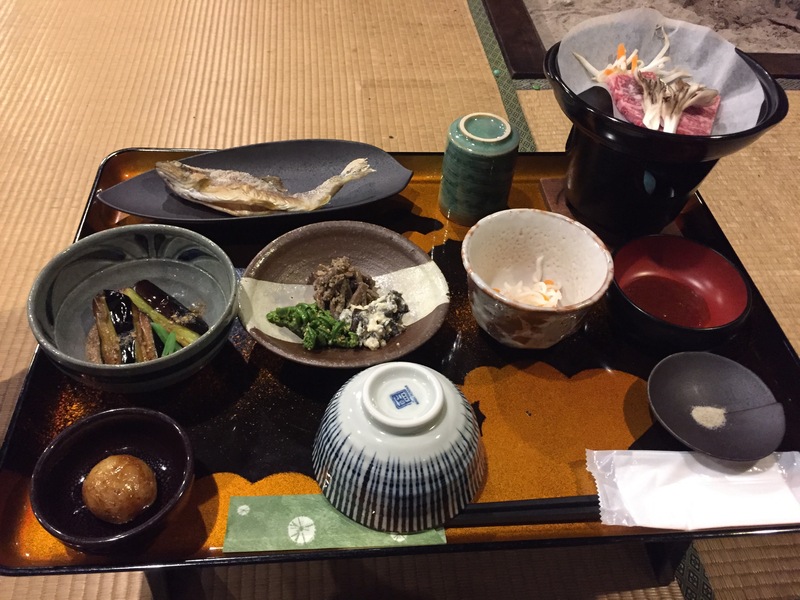 Dinner was multi-course – the main course of rice with grilled miso beef, fish, mountain vegetables and pickles was served first, followed by a bowl of miso soup, tofu (resembling an ice-cream on a stick), tempura and fruits. So try not to over-load on rice too early in the meal! Our main consideration for spending a night in Shirakawago, apart from enjoying the experience of staying in a traditional house, was to avoid the day-trippers… and there were plenty of them, given how accessible the village was to the nearby town of Takayama, only a 50-minute bus ride away. We woke up early to explore the small village (6.30-7.30am) and what a marked difference it was from the bustle of the previous afternoon! It was quiet and peaceful without the crowds, more befitting of a picturesque countryside village. I dare say that the only grouse we had was the dilemma of choosing between spending more time outdoors exploring the pretty as a picture village or lounging indoors soaking up the simple comforts of the ryokan! On hindsight, perhaps an extra night may have been the solution :-) Arigatou Gozaimasu to our hosts for their hospitality and for opening up their home to us! I had an awesome stay at Shirakawa-go with my family. 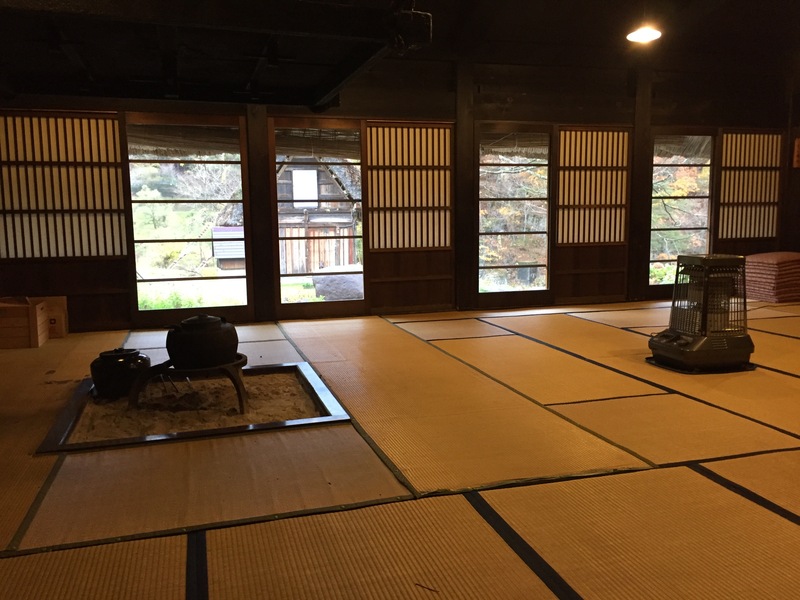 We are really glad that we opted for a ryokan stay at Shirakawa-go as the place is much less crowded in the evening and early morning before the crowd comes in. The host was very friendly and the food was superb. Helped ourselves to second and third servings of rice as the food is too good. The rooms are clean and beautiful, we could even see the beautiful scenery from our room. The rooms are heated so you won't feel cold even during winter. There is a hot bathtub in the ryokan, it can warm you up with just a 5-10 min soak. There are snow boots available to borrow from the host. Look forward to visit again when we have the chance. Magoemon is quite near the bus station, about 5 minutes of walking. Love the hosts and the food. No aircon but the heater and heating cushion and futons are sufficient. Also there were snow boots available to borrow. One of the best stays in Japan for sure! Shirakawago is a pretty touristy place, so being able to be in the village after all the tourists left in the evening, and before they arrive in the morning after is the most amazing and peaceful times ever to explore the village. Magoemon is situated right smack in the center of everything, so it is pretty convenient to walk around. The host is very friendly and helpful, they understand and can communicate in a little bit of english, so it is very easy to settle down. The rooms are clean and there are light snacks which were yummy, I think some of us bought the same senbei in the village after. There are free parking available as well which is great, and the staff helped us clean the cars after a fresh layer of snow overnight. Very friendly! And of course, the food is fantastic!! I'm not a vege eating type of person but I enjoyed their vegetable dishes. The only thing I can nitpick about is that the dining area's heating is turned off when it is not in used, and you have to pass by it to get to the bathroom area from the rooms. So it gets really cold and I have to run pass it very fast!! 5-star experience. Sparkling clean room, common toilets, shared bathroom. Room with nice view. 10 minutes relaxing stroll from bus station. 15-20 minutes stroll from the observation deck. Nice wooden tub - private bath. Heating is good. Host is good and nice. Cannot think of any flaw, except for you share the only shower room with others, hence you can\'t really enjoy the wooden tub \'onsen\' for a very long time, unless you wake up early in the morning at 6am before breakfast. The food is heaven. My records, 3 bowls of rice for dinner. 4 bowls for breakfast! Only some simple vegetables, pickles, miso soup, grilled fish. hoba miso, hida beef, but don\'t underestimate it. The best meal I had in Japan. Better than any 5-star hotel. :) Will definitely come back. Booking with Japanese Guest House is very smooth and easy. We spent one night at Magoemon. The host family was very friendly and explained us everything with limited knowledge of English. Toilet and bathroom were clean. We got a room with a nice view. Very quite and we could hear the river. The dinner was very delicious, we didn't expect that we got so many dishes. And breakfast was also good. We also enjoyed the bath. It will be better if the using time can extend a bit longer (especially with a lot of guests). On the other day, after breakfast, we could walk around in the neighbourhood without too many tourists. It was really a nice unique experience. My partner and I stayed at the Magoemon for 1 night, and it was one of the best stay of our trip! We slept in room with a beautiful view on the river. We had dinner and breakfast in a large room with other guests ant everything was delicious! The staff was really kind. The village had something magic, expecially in the evening when it was very quiet. I definetly recommend to stay one night here. La struttura e' molto semplice e curata. Gestori estremamente gentili, poco inglese ma ci si capisce benissimo. Buone le pulizie ed ottimi i pasti. Comodo parchegguio se si usa l'auto, posizione molto tranquilla. Totale corrispondenza alle foto pubblicate. Me and my family had a wonderful stay! The hospitality, food, location were extraordinary. Would come back anytime! Magoemon is a nice cosy place in the middle of Shiragawago. My wife and I arrived at this small town in the middle of this summer period. It is still not that hot but the sunshine has been a bit glaring. When we reached Magoemon, we were greeted by very polite and kind hosts whom introduced us to everything inside the hostel as well as the town. In this town we don't get to hear any noise pollution. We had a very peaceful stay here. The food served is very traditional Japanese cuisine which is very fresh and healthy. Even though the hostel looked traditional from it's exterior, the interior is very well decorated. The rooms, especially the washrooms, are super clean. The hosts has also kindly helped us to lay out the Futon and pack it back during our meals. They did it during the short interval when we had our meals. Even though the dining hall oversees all the entrance of the rooms, we don't even know when they entered and left! They are some fast and efficient. The visitor center is another place that all tourists should visit. It costs us about 300 yen per person if I remember correctly. There is a very nice short video about the culture within the town. There is a small exhibition center where we get to have a look at different artifacts. We were also treated with their traditional rice wine. If given a chance we will like to come back in the winter. The view of the whole town looks fantastic from the hill and from what I understood, they will have a common gathering area where everyone cooks food using the traditional Japanese barbeque method. Overall my wife and I had a very memorable and wonderful stay. We had the most wonderful time at Magoemln. The village itself was idyllic, particularly in the evening sun when there was no one else around. We had gorgeous weather so had the doors to our room open overlooking the rover. The hostess was extremely friendly and helpful. Food was OUTSTANDING- dinner was the best meal I had in Japan. There was a family from Singapore staying at the same time as us and it was lovely chatting to them over dinner and breakfast. I didn’t stop smiling during my entire stay. 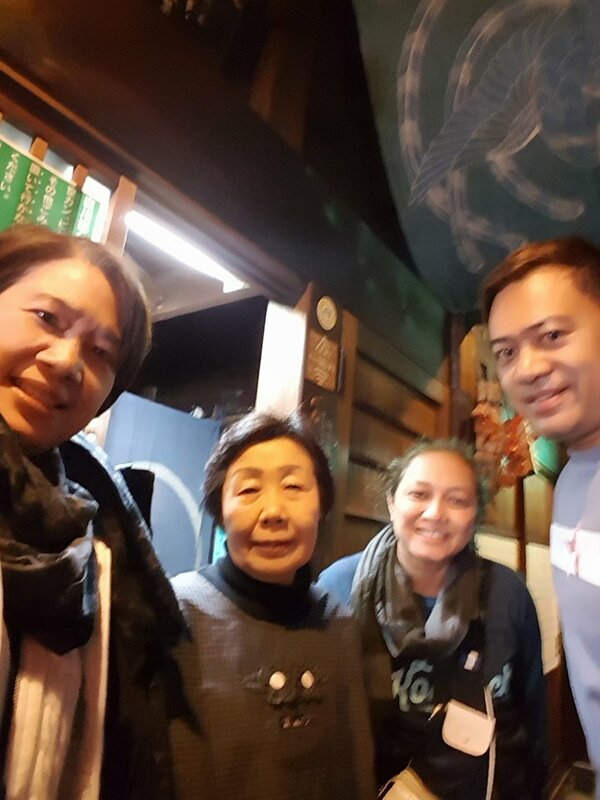 We enjoyed our stay in Magoemon.We got to know a group of friendly guest from Okinawa during our stay.The host were very friendly and the food was outstanding.We had a great time in the evening and early morning without other tourist around.My kids love Shirakawa-go so much and here is our most favorite. We highly recommend this place to our friends. Fue una experiencia muy agradable en todos los sentidos. Destacar tanto la cena como el desayuno, comimos cosas que de otra forma hubiera sido difícil de probar. El pueblo al atardecer es muy tranquilo y duermes con el croar de miles de ranas que traspasan las paredes de papel de tu habitación. Tal vez me hubiera gustado alguna explicación más tanto de la casa, constumbres e incluso de las comidas; pero no por ello fue una estancia placentera. Gracias a Japanese Guest houses por las gestiones e informaciones previas. We stayed for one night and loved it. It has a quiet location next to the river. The house is lovely - full of character and history, very clean, great food and friendly hosts (we had the grandma hosting and though she spoke very little English, it wasn't a problem, there are signs in English for the critical matters such as hours for using the bathroom, dinner time etc). We found the house to be very quiet. Haber estado en Magoemon ha sido vivir una experiencia única, singular, entrañable y muy agradable conociendo de cerca este pequeño pueblo japonés. La cena fue una delicia. Inolvidable. El ambiente del pueblo al caer la tarde especialmente cuando los turistas ya no están, el silencio, el inmenso paisaje, la esencia rural, son únicos. El alojamiento es muy especial. We stayed at Magoemon for one night. It was a beautiful house, the food was brilliant and still makes my mouth water. The hosts were very nice and welcoming. We would definitely go back there again! It was a great experience staying at the house and having dinner together with the other guests. The food was really good and bathroom was shared but absolutely clean. The place is worth the visit to disconnect from the city. The museum of the village is almost everything in Japanese but if you are interested by the architecture and want a to see a quiet and nice is worth the visit anyway. Magoemon was exactly what we were hoping for, a traditional minshuku which was small and authentic. After a excellent day exploring Ogimachi, we headed back to Magoemon. The building itself is quite wonderful, and the hostess was so helpful and hospitable. The dinner and breakfast were fantastic, and we really enjoyed the communal dinner, where we had an opportunity to talk with other travelers from different parts of the world and share stories. If you have time, heading to the onsen down next to the river is a must do. It was so good. • Can put bags prior to check in time. • Location is quite close to public bus stop, away from the tourist concentration, just behind can view the river. But some gravels just before the house so if carrying stroller is slightly troublesome and during rain can find puddles. • Younger lady host can speak a bit of english but not the older lady who seems to be at the guesthouse most of the time. • Breakfast and dinner were nice, felt local with hida beef with sweet miso, ayu fish, traditional pickles, miso, etc. 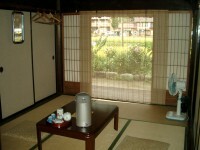 • Room was spacious, tatami quite big (2 tatami enough for me, wife and a 2-year old), very cosy as well. • Heater was all in japanese so difficult to set up. • Only 1 private bath to share with all guests, with traditional big hot tub made of wood. • All in all it was a memorable experience with the major upset was only the heater. This place made our visit to Shirakawa-go very unique and pleasant! The food was delicious and the service was wonderful. We highly recommend staying here and would definitely come again in the future. Excelente servicio y atención, las instalaciones muy cómodas y cálidas, la comida deliciosa. Magoemon was such a great stay! The food was delicious and great hospitality. Would definitely stay again. was a little concerned prior to arrival because an introductory email advised that this being a heritage site, the building may not be as well heated or equipped as other places. very relieved and pleasantly surprised that the portable heater kept the room sufficiently warm and the bedding was very comfortable. meals were good and the elderly lady we met was always smiling. 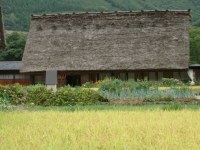 would definitely recommend spending a night here in shirakawago to experience this beautiful heritage site. Shirakawa-go is a beautiful place. 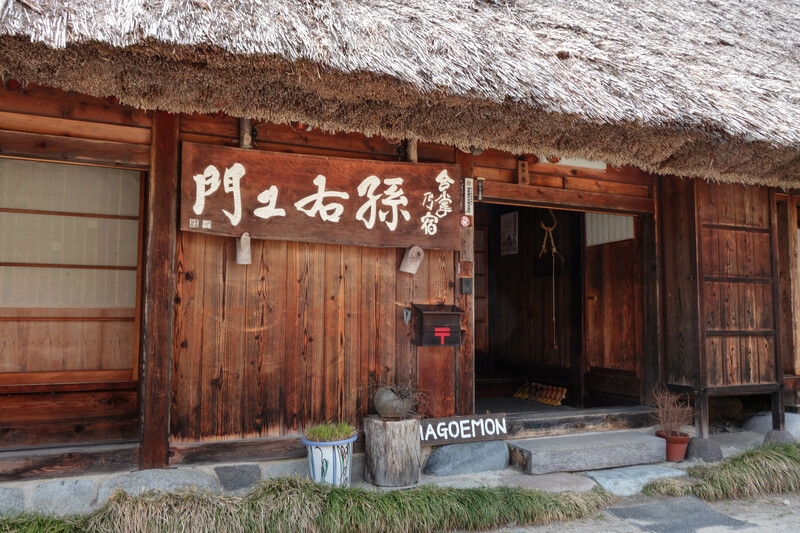 we stayed 1 night at Magoemon, it was a good experience staying in a traditional guest house with traditional dinner and breakfast, bathroom with onsen. Me and my friend stayed for a night. The food was a lot and very delicious especially the beef! Place was very clean and peaceful. The old woman was very friendly and accommodating. Overall, the experience was extraordinary! Hopefully can come back someday. Shirakawago has its magical scenery in winter. When I decided to stay there (thanks to Japanese Guest Houses help) especially in Magoemon, I've done the right decision. I was pleased with warm welcome from the hosts (granny and her daughter, I assume). I can borrow boots and umbrella and explore the village. The dinner and the breakfast are satisfying. Very delicious. The place is authentic. You can feel the traditional ambience inside. Definitely will come here again. I love the most is the authenticity, the hospitality, and to add that the location is at the center of everything! I don't need to question of the cleanliness of the place, most Japanese places I have seen and been into are spotless! The food was very authentic, I can feel the warmth of the Granny who cooked it. I would definitely come back to Magoemon! We visited and stayed at Magoemon 1-2Feb. My sons love it. We family of 5 had a great experienced with an awesome view of ShirakawaGo. Dinner and breakfast was great with other guests. Bathroom facilities also very clean and modern. Ryokan closed to bus station. Map given; direction how to get there, very useful. Thank you to Japaneseguesthouses.com for arranging our stay in Magoemon Ryokan. 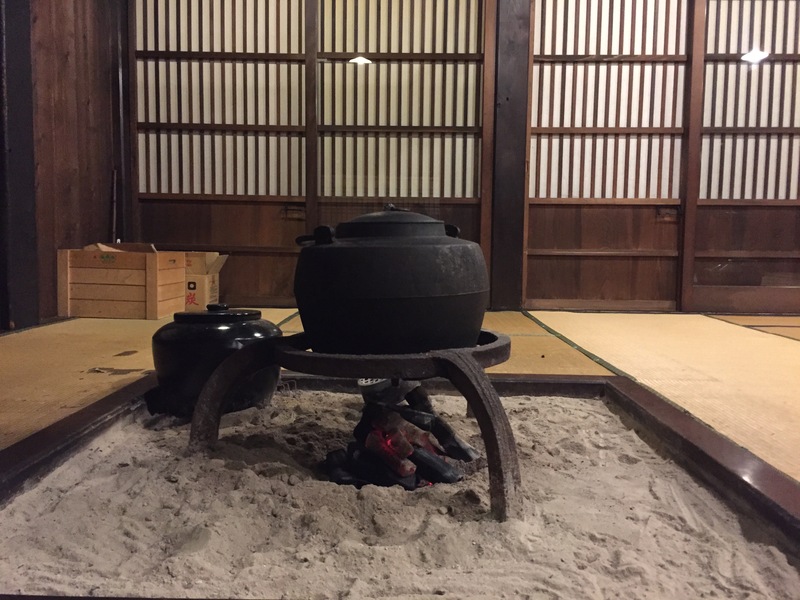 We visited Shirakawa-go early January and had an absolute blast. It's a beautiful place, made more special by not having to rush off the same day. 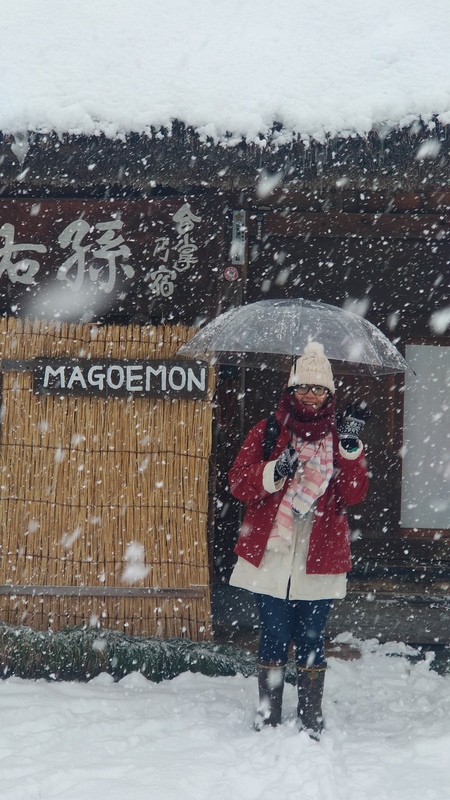 We dropped our bags off at Magoemon in the morning, and they even had Wellington boots (wellies) we could borrow. It was easier to walk in the snow so that was good. The accommodation itself is basic but comfortable. Powerful gas heaters kept the room warm, and it was fairly easy to work around the shared bathroom schedule. Food was good and we covered a lot of the highlights including Hida beef and local mushrooms in miso. I will remember my stay for a long, long time! Host was hospitable. It was a neat experience staying in Gassho-zuruki farmhouse. I was worried about visiting during December because of the thin walls. There was proper heating, so being cold at night was not a concern. The food was good quality and very tasty. Shirakawago is VERY crowded. You can only get the tranquility and peace after the tourists are gone. Staying overnight definitely was worth the trouble. I stayed at Magoemon with my mom and friend You have to book around three, four months in advance. We went in winter. It was excellent. This is one of the bigger inns, so they can accommodate a large group with many rooms. The snow was several meters deep. When we arrived it was snowing so hard we could barely walk. The older woman who runs the inn can not communicate in English at all. There is another young woman who helped served meals, but she couldn't speak English either. They were able to call us to meals. They explained the sleeping arrangement by pointing. It was never a problem. The rooms all have individual kerosene heaters. We were extremely comfortable the whole time. 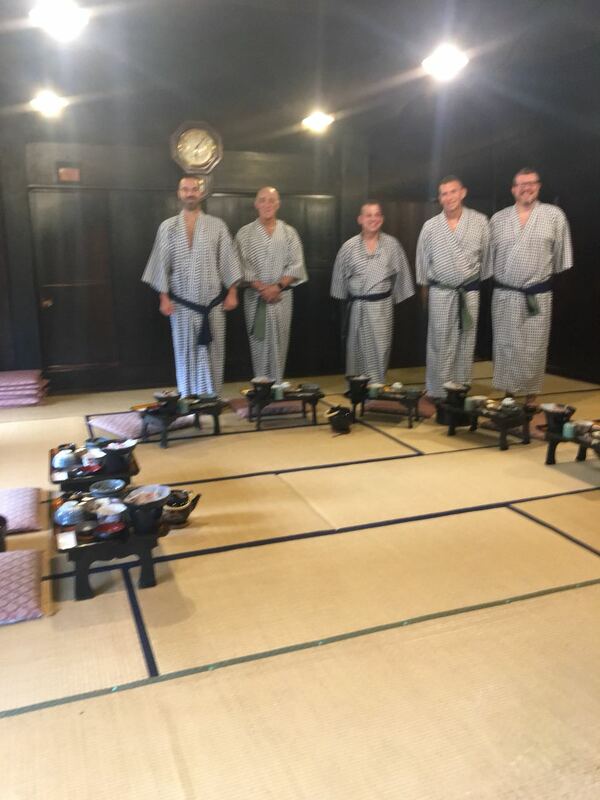 Meals were served in a large communal tatami room. You sit on the floor. We aren't in great shape for that, but we managed, having to move our legs around sometimes to help circulation. It was not a problem. Dinner was excellent, Hida beef, lots of Japanese specialties like grilled tofu. A wonderful, filling meal. Breakfast was also very good, but we like Japanese breakfasts. Rice, grilled fish, seaweed. Very filling. The inn is beautiful. We saw the tourists who arrived for day trips by bus and leave after a few hours. It is so much better to spend a night in one of these inns. Around 4 o'clock they have all left and you have the whole village to yourself, covered in snow. It is really, really nice to see the sights under the stars or with snow falling. Check-out is early, so you have time to explore the other inns. There is a nice museum where you can go and see old pictures and go up to see the underside of the steep roof. Worth it. There is also a nice hot spring in the village where you can relax. It's clean and modern. We had soba noodles at a restaurant before we left, there aren't many cafes or restaurants around. Overall, it was a great visit because of this amazing traditional inn. It is really a privilege to hv the opportunity to stay in a 290yr old Gassho. I hv stayed in many rokyan but not gassho n it is a magical experience that i feel it is a privilege that u cant get it else whr. Host was so thoughtful that language has no barrier. Location is so convenient, short walk fr terminal. Dinner n bfast were yummy n a diff style of cuisine that i cant get elsewhr in Jpn. The Architecture of the house is like a great piece of art for my imagination of how the villagers live many many years ago. The View was magical as it snowed the night before! Shared bathroom w pte bath facilities n my family had a great bonding time taking shower together! Everythg was perfect! Highly recommended experience if u r visiting Shirakawa-go. Its my 2nd visit but didnt stay in Gassho previously. Visit to Shirakawa-go is not complete without the stay. 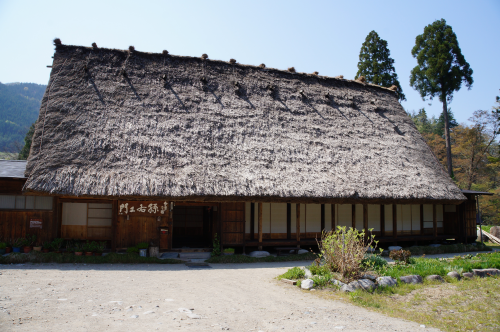 We had a great time staying in this old minshuku. The location is strategic, quiet but convenient to walk atound. The home-made style food was splendid and the rooms are clean with nice river view. We had 7 people and originally booked 3 rooms. With our big stuffs lying on the floor, the hosts were so thoughtful providing us an extra room preparing futons for us without any extra charge. After the check-out, we were allowed to leave our stuffs at the house while further exploring the village. All of our friends love this minshuku and hosts. We also had a wonderful time at the onsen nearby at night and walking in the moonlight which was such a memorable experience. Ryokan is very clean and tidy. Although bathrooms to be shared with others, everything is well set up and hassle free. Ryokan is very near to terminal, easy to be found (just beside the river). You can even admire the breathtaking scenery of riverside. Host family is really helpful and polite. Food is scrumptious! Portion is huge, you will feel really satisfied. Recommend everyone to stay in this ryokan! Went to Shirakawago in end October. The weather was cooling and cloudy. I stayed here with my boyfriend, and both of us do not wish to leave on the next day. The dinner and breakfast was fantastic. The beef was so good! Although the house looks old, it is maintained well and clean. The toilet and shower facility is very new. The bed was so fluffy and warm. I would definitely come back again if there is a chance! October was a fantastic time of year to see this lovely town. This inn only made it more special. Best food we had in japan and we got a great night sleep. Only downside to this place is that the walls are very thin. Our rude neighbors were talking full volume at 6 am and we could hear every word through the wall. However we knew this would likely be the case since we were staying at an old inn like this. So if you are okay with this, you will not b disappointed by this place. Money well spent. we are very enjoyed and happy stay here. Everything was great. Magoemon is a magical place. The house is beautiful, in the perfect gassho-zukuri style, facing the river, in a very impressive corner of the village of Ogimachi. 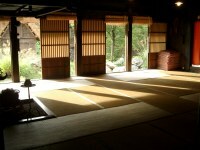 The room is made of wood, with tatami on the ground, where futons are put to sleep. On a small coffee table are left a thermos of hot water for tea, biscuits and a fresh water jug. Dinner and breakfast (kaiseki) are served in a dining room, together with all the other guests. Bathrooms are shared, 2 wc for ladies and 2 for gentlemen, 3 shared washbasins along the corridor, a bathroom (beautiful, all wood !!!) which in turn can be used privately in pairs. The timetable is strict: check-in at 15:00 (coming first, leaving luggage), bathroom 16: 30-21: 30, check-in at 18:00, breakfast 7:30. The old owner speaks only Japanese, but she is kind and nice and you can understand very well. Wonderful Experience and excellent food. Even my two daughters (1 and 4) enjoyed it. Magoemon was the most highly anticipated part of my trip and I was not disappointed ! The trip to Shirakawago from Takayama or Kanazawa was approximately 1 hour easy bus ride. When we got there it was like being in a fairytale village. Magoemon is a handsomely appointed Gassho-zukuri near the river. The owner lady greeted us at the door to drop our bag off and went to explore the village including the observation hill. When we checked in, the bath was available - it is shared with the other guests so you go in and shower then dip in the hot baths. Such a good way to relax after a day of exploring. We got dressed in our Yukata, ready for dinner. The food was amazing. 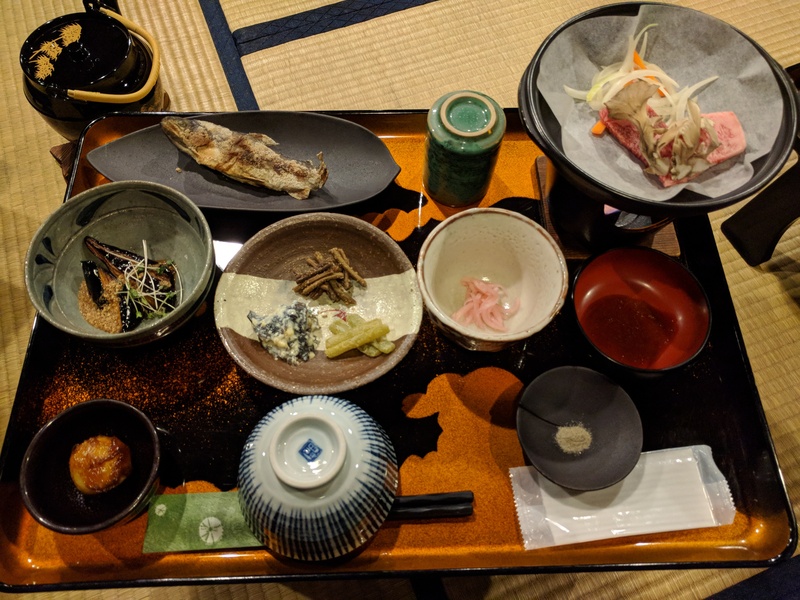 Hands down the best food I had in Japan - and we didn't go to any places for food. Simple yet delicious. This goes for breakfast. For the price we paid - this was a total treat. Highly recommend ! Staying at Shirakawa-go was an amazing experience. Only 1 couple with small very well-behaved child was there. We could leave our luggage until check-in. Very obliging and helpful lady at lodge. Unfortunately I am allergic to fish so they could not prepare a meal for me. My husband enjoyed his meal and the breakfast. A special bath was prepared for us. It was most enjoyable. beatiful experience. not to be missed. Stayed a night at Magoemon after driving from Hida Takayama. We arrived around 3-4pm to check in and had some time to walk around the village before dinner at 6pm. It was raining the day we arrived and it was difficult to get a good picture with the throngs of tourists walking around. The landlady was sweet and soft spoken. She explained that the bathtub was not working so the inn would let us have complimentary passes for the onsen which was about 5-6 minutes walk away. Dinner was served in the living room around a hearth with a pot of boiling water on top. We enjoyed our dinner of hida beef, grilled fish and tempura. After dinner, we went to the onsen to enjoy the facilities. The room was spacious and fitted the four of us nicely. The blankets were soft and kept us warm through the night. The next morning, we woke up early before breakfast to walk around he Village and take some pictures. It was peaceful and quiet as the tourist busses had not arrived. 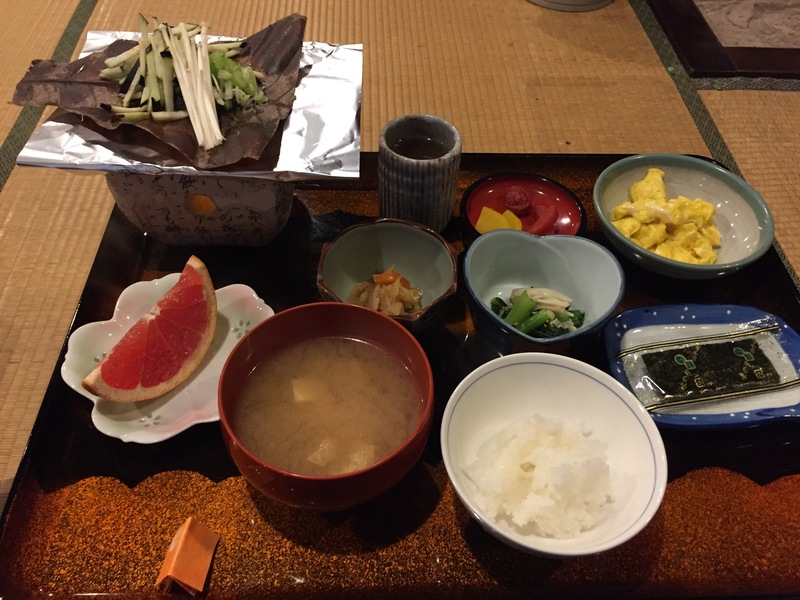 After that, we had breakfast (vegetables in miso, scrambled eggs and seaweed) back at the inn. We checked out and headed to the Tateyama Alpine Route. Overall a fun and enjoyable experience. I spent one night at magoemon last January. Everything is splendid! The traditional guestroom and bathroom. Dinner with hida beef and grilled fish was wonderful! I'm planing to visit here again this winter! This 280-year-old house is quite good. The staffs are nice. Clean room, friendly staffs, good foods (Especially the fish), easy to access location! An unforgettable experience! We had a very nice stay here. The room was small but comfortable enough. It has nice view when we open the side-door. The heater was old and blew out oil smell when starting, but it's fine anyway and warm enough. The bathroom is clean and the meals are all very delicious. We love our stay and would like to come back one day. The house is very comfortable. The room is clean. Bathroom & toilet is perfect. The food is very nice. We had very good time in the house. I stayed a night here totally 4 guests. They prepared 2 connected room for us with the river view from our rooms. We really love their dinner. Enjoy hida beef with miso sauce and grilled fish. The bath room, we had to share but its clean and hot water are comfortably. Snow everywhere! We spent a cold day in Shirakawa-Go, and, despite of that, the house was incredible. The room was directly in front of the river and quiet night: only the sound of water descending the valley could be heard. Great traditional dinner and breakfast, unique atmosphere and hot bath to relax. We will never forget this experience! Stayed one night here and had the best night of sleep in onde Monty traveling through Asia. We spent only 1 nighht here but it really impress us all. Oba-chan is so kind. The atmosphere is great even without snow. The food is one of the best in our trip, the beef and fish are so delicious we can't stop eating it. The rice also very good that we have to fill up many times. The location is a bit difficult to find but very close to the entrance of the village. The room amy be a bit too small for 3 people so oba-chan give us 3 rooms for 6 people which is very impressive. We were very enjoy staying here. Only thing that disturb me is that we have 1 children (4 years olds) with us and in the web it said we don't have to pay, but actually she charged us for 1,000 yen for the kids. At least it shoukd be mentioned clearly in the epwebsite or since the check-in process. Dinner and breakfast with the other guests from Japan, France and Australia was the most memorable experience to my family. Food was excellent. Hostesses always showed up at the right time, as if they could gauge exactly when we needed their service. The four of us stayed here for 1 night, and it was a splendid stay! We had the front room, and it was large enough for the four of us. The futon is great, dinner and breakfast was exceptionally delicious, and the host was very kind. 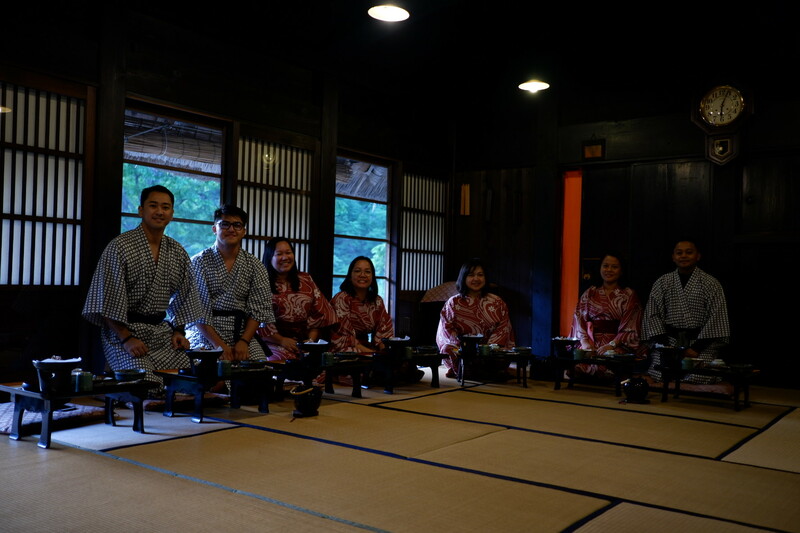 Definitely one of our more memorable experience for a more traditional Japanese feel. The breakfast and dinner were absolutely delightful. Room was comfortable. Since there is only one bathroom, it can get quite crowded at "peak hour". 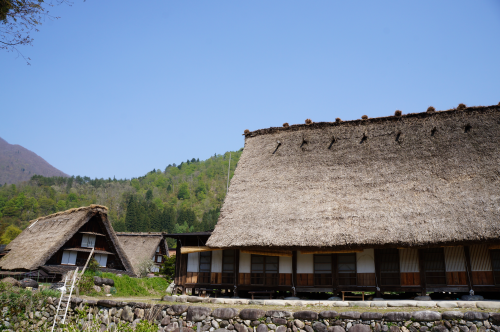 Overall, a must-do experience in Shirakawa-go. More than a guest house..
My son and I stayed here for one night. It was a beautifully maintained home next to the river. The accommodations were very comfortable. Shared bathroom was not a problem - very clean and well kept. The meals were perfectly prepared and presented. 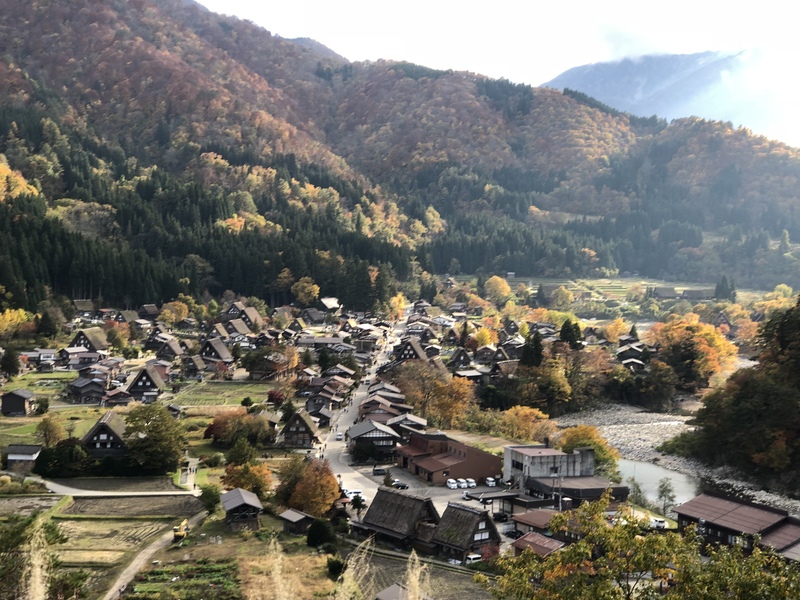 Our visit to Shirakawa was the highlight of our 2 week trek across Japan. I highly recommend this peaceful retreat! Shirakawa-go is certainly a very interesting location. For the lovers of culture it is an excellent place to go. We spent one night there. The staff is very friendly. They don't speak English or have limit knowledge of it but with some effort you can understand everything. They are cordial and friendly. The rooms are large. 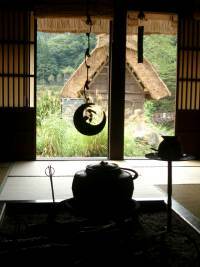 It is a traditional ryokan. Don't expect luxury and comfortable chairs or bed. Mattresses are provided and you have to sit on the floor. The food was very good, a lot of variety and different tastes. Breakfast is warm traditional japanese style. They were friendly enough to cook our eggs (for the japanese tourists it was raw). You receive traditional clothes and had the change to walk with wooden slippers. Important: visit as much as you can during day light because in the evening is extremely dark outside and full of bugs. My wife and I travel to Japan almost yearly and try to find unique and special places to visit between our stays in Tokyo and Kyoto. 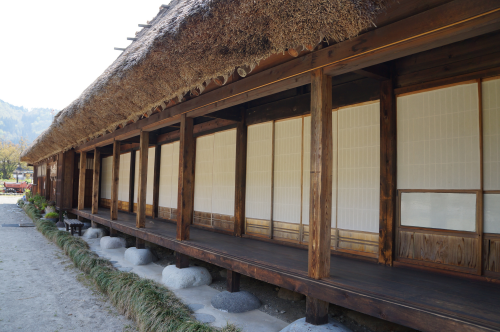 This year, we were fortunate to find the village of Shirakawa-go and their Gassho style homes and ryokans. Staying at the Megoemon ryokan was a wonderful experience taking us back to how it might have been in the "Old Days." The village is amazing, but staying overnight at the Megoemon after the tourist leave is unforgetable. You really get a sense of how it might have been in times past. The hospitality was great and the food outstanding. One can truly imagine how it must have been living in a Gassho stay home, especailly when they stoke the fire in the hearth and cook the sweet fish for the guests. I would recommend this adventure for anyone looking for a special treat. i spent one night at magoemon last dec and it must one of the best stay i had in a traditional guest house and dinner. The food was really good and feels really like home. The owners were very nice and the whole place was clean and tidy. there was even a hot traditional bath in the house and it was good relief from the cold and snow outside. would definitely stay in the house again when i m back ! I stayed at Magoemon with my mom and friend for a night. We arrived early so we just left our bags in the room and explored outside. It was really cold when we were in Shirakawa-go so it was a good thing that all the rooms had electric warmers inside. The food was delicious! We can't stop raving about it until now. Everything was so fresh. The host family was very friendly and helpful. Rooms were clean and quiet. Bathrooms were also spotless, just don't forget to bring a pair of fuzzy socks if you go during winter time. The hallways to the common toilets are not heated, so the floors are cold. Overall, the best experience I have had in Japan! I will definitely be back.